Carol LeResche at her home in Clearmont, Wyoming. In 2003, Carol LeResche and her husband, Bob, packed up their Alaska home and moved to Sheridan, Wyoming. She was born there. And, in 1996, they had bought a ranch on Clear Creek, a few miles downstream from the little town of Clearmont, forty miles east of Sheridan. The place grows alfalfa and pastures angus cows and calves. It also has the most essential asset for growing crops in this coal-bed underlain region of the Powder River Basin: the creek’s pure waters, originating in snowfall in the Big Horn Mountains to the west. 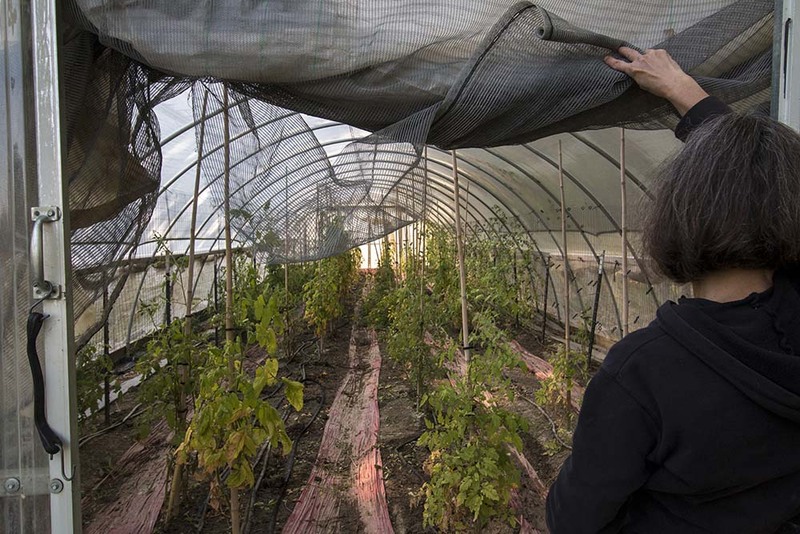 Carol enters the hoop house to check her tomato plants. Carol started growing bigger gardens, and in 2005, she and her friend Mona Mitzel – another Powder River Basin Resource Council member — started their own CSA. That CSA, Clear Creek Valley Produce, served Gillette, Buffalo and Sheridan. “I just like to garden. I like good food. It’s been an evolution for me going from growing it for myself to growing it for markets, to building a CSA.” Carol said CSAs are a lot of work but also very rewarding. Shortly after starting the CSA, however, development of coal bed methane (CBM) threatened Carol’s operation. To extract methane (natural gas) from coal beds, producers first pump groundwater — usually millions of gallons — from coal seams to release the trapped gas. 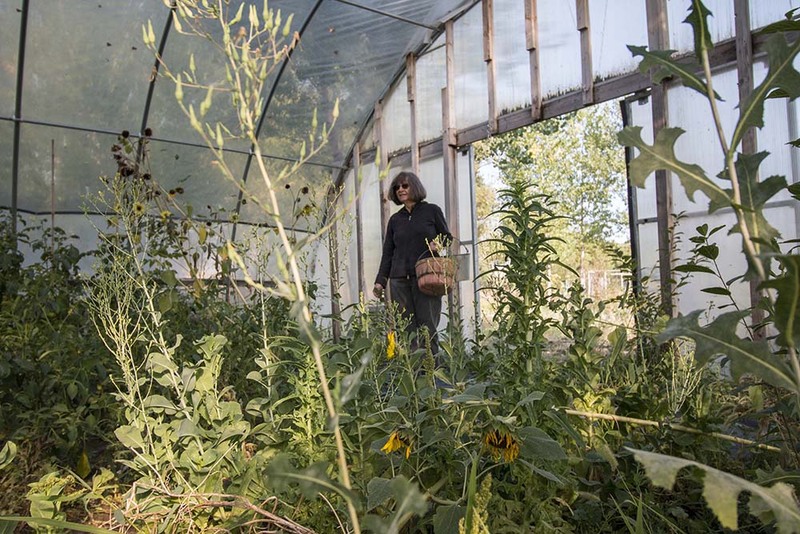 In places like the Clear Creek Valley, that groundwater is laden with salts, and if it was released into the creek, the water could become toxic to the alfalfa in the fields and especially to the vegetable seedlings nurtured in Carol’s greenhouses. Split estate ownership happens when the surface rights to a property — i.e. the ability to build a home, to ranch, or in Carol’s case, to garden — are severed from the subsurface property rights because the original owner of fee title sold the surface and retained the subsurface, or sold surface and subsurface to different parties. Another significant source of split estate land includes the latter Homestead Acts, which retained subsurface rights for the federal government. Wyoming state law explicitly gives preference to the mineral owner and guarantees them “reasonable” access to their minerals. This creates conflict when the two surface and subsurface owners' interests compete. Often, especially in the West, the owner of the mineral rights has deeper pockets, and stronger influence in local and state government. The mineral owner's power can make it almost impossible for individual landowners to keep their land intact and productive. The mineral companies generally win out. In this case, however, the company was not able to overpower Carol. One day, a landman showed up at the LeResche’s home asking them to sign a surface use agreement with the methane company. Carol and Bob declined and hurried to join Powder River Basin Resource Council to defend their water and livelihood against the abuses that were extremely common in the industry. “We thought that being part of an organization with many people working on these issues would give us a greater voice than trying to plan alone for the impact to our land. That’s why we joined Powder River. PRBRC had lots of information concerning methane development and how we could influence decisions made concerning our land and water,” Carol said. The Department of Environmental Quality (DEQ) held hearings with stakeholders and current users of Clear Creek to decide whether or not to issue a general “watershed” permit for methane developers to release “produced water” across the entire Clear Creek drainage. Powder River arranged for the LeResches and Mona Mitzel to have official seats at the table as legitimate stakeholders. “As we were going through those hearings we fought for the principal that existing users of Clear Creek should not be disrupted by uncontrolled discharge of methane produced water,” explained Carol. Carol used Clear Creek water for her gardens, and was convinced that uncontrolled discharge of produced water would disrupt her vegetable operation. She located United States Geological Services (USGS) records of water quality in Clear Creek, which dated back to 1959. Powder River organized a group of members along the Clear Creek valley to collect water samples on a regular schedule. Powder River paid for these samples to be analyzed for constituents common in CBM produced water. Using USGS past research and the “Clear Creek Monitoring Group’s” data, Carol showed that methane water discharged under the proposed watershed permit would severely impact her garden and harm an “existing use.” This would put the proposed extraction in violation of Wyoming law. Clear Creek Valley Produce in Clearmont, Wyoming. The DEQ came out and looked at Carol and Mona’s operation, and they agreed. When they found that granting the watershed permit as drafted would, in fact, harm Carol’s garden, DEQ backed off and never issued the permit. This slowed down the methane rush in the valley, and the few wells that were drilled didn’t produce. Then came the statewide CBM “bust,” and the LeResche ranch and Clear Creek seem safe from harm — at least for now. Since this big, early scare, Carol has continued to grow food for her community, and she encourages others to take it up as well. “What I’m doing today is growing vegetables. I am all involved in food and what it means and how it’s important in a community,” said Carol. 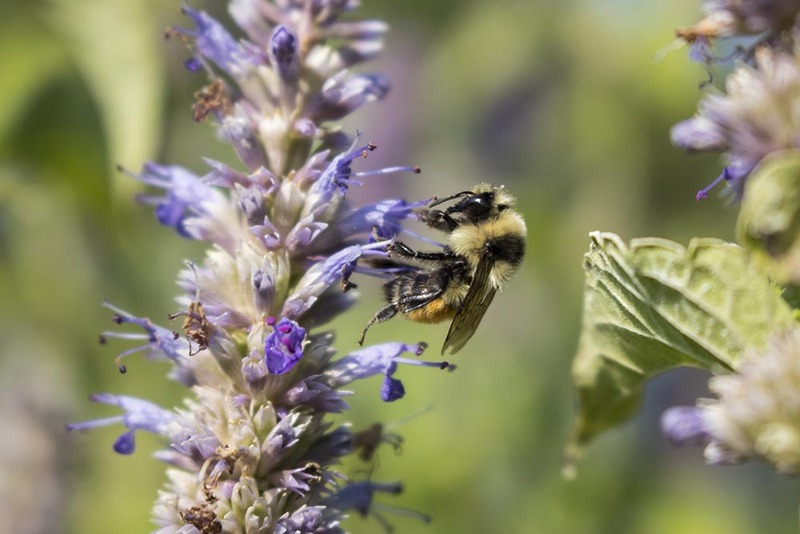 A pollinator in Carol’s garden. The interest in local food has grown significantly across Wyoming since Carol started her operation 15 years ago. Carol at Clear Creek Valley Produce.